Mid- and large-size performance marketers, who want to gain insights and drive additional performance out of their media-buy. Data-driven marketing attribution which enables marketers to make revenue based decisions in real-time. 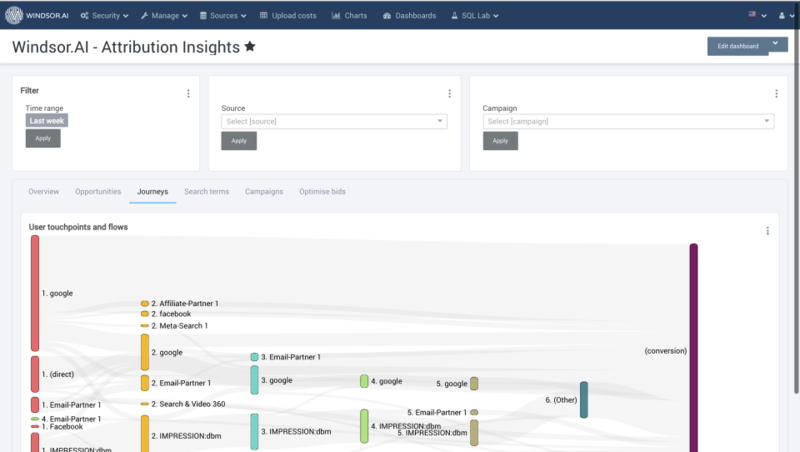 Attribution Insights Reviews Recently Reviewed! Pros: The support team are fantastic and have been really helpful in understanding our needs and customising dashboards and features to our channel mix. The data provided by the tool has allowed us to adjust our spend across channels and reduce cost per lead for our 2 clients using the software. Cons: There are a few cosmetic issues that probably need to be ironed out but the tools are always developing and with the rate of improvement I'm sure these will be sorted soon. Overall: Overall this is an incredible tool and the setup has been made relatively painless by the helpful team at Windsor AI. Implementing this tool for my clients has given them greater confidence in the work we do and we've been able to make changes that have improved performance and lowered CPA. We're just getting started and look forward to the new features that are constantly being added. The weekly calls are a great chance for me to exchange ideas and strategies and the Windsor team are always open to feedback and suggestions for new features. Impressive increase of ROI: a unique tool in the market! Pros: We used the tool to re-allocate budgets over our paid media channels and we increased the ROI massively! It made me understand the effectiveness (ROI) of my digital media campaigns and channels, based on attribution modeling instead of last-click conversions. You can use it high level, on the channel/campaign level, but if you want, you can go deeper into Ad levels... Apart from that, it's a great tool to monitor your media agency, to make sure they spend your money in the correct way. The tool (dashboard) itself is easy to use and very actionable (which makes it unique). The support from Windsor.ai was really good. Recommended for each marketeer. Cons: The look & feel of the dashboard can be a bit more fancy. Overall: Easy to work with and extremely effective. Thanks very much for the review!